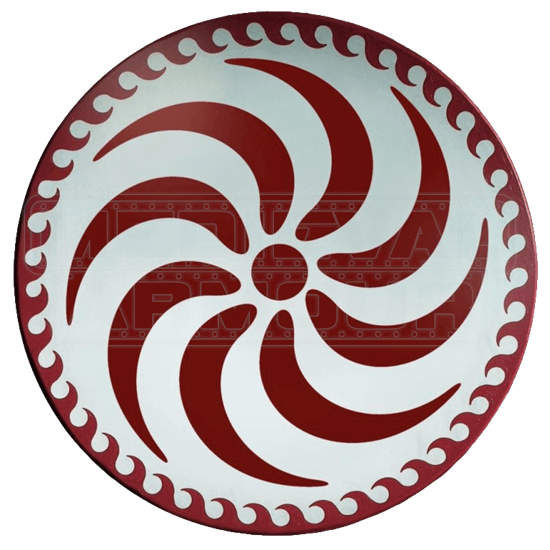 The Wooden Round Greek Red Spiral Shield is a simple and elegant shield that features a subtle Grecian design. This shield is hand-made and hand-painted using quality materials, making it suitable for both use and decoration. The front of this shield features a decorative red spiral design set on a pale gray background. The spiral consists of a red circle surrounded by several curling blades, making the center of the shield look almost like a fan. Surrounding this spiral design is a Greek-inspired wave border, also painted in a vibrant red. This fully-sized shield is approximately 31 inches in diameter and is made entirely from 0.5 inch thick smooth composite wood, which gives the shield strength and durability beyond that of traditional plywood. This ensures that not only is the shield well-made, but it is also well-suited for actual use. The back of the shield features dual leather straps which provide an excellent and secure grip. One strap goes around the forearm while the other is held or gripped in the hand. The front of the shield has also had several coats of varnish applied in order to help protect and perverse this shield from whatever wear and tear it might accumulate over the years. The Wooden Round Greek Red Spiral Shield is just as suited for use as a decorative item as it is for actual use. Hang it on your wall, take it to sparring practice, wear it to a local Renaissance Fair, or give it as a gift - you will not be disappointed!